State Senators Randy Vulakovich, Don White and Scott Hutchinson applauded the Administration’s commitment of $2 million in state funding for the rehabilitation and restoration of Glade Run Lake Dam and thanked Governor Tom Corbett for supporting a key southern Butler County tourism and recreation destination. Safety concerns about the dam forced the Fish and Boat Commission to drain the 52-acre lake in Middlesex Township nearly three years ago. The three senators jointly advocated the project which involves the reconstruction of the dam’s concrete spillway and the reinforcement of its embankment. 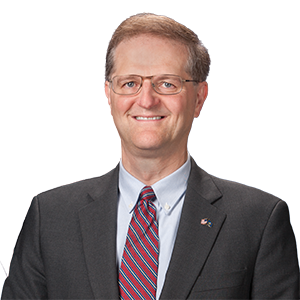 In a joint letter to the Governor, dated January 24, 2014, the legislators noted the efforts of a strong private-public coalition in support of the project and urged the Governor to release capital budget funds for the work. The project has the support of the Fish and Boat Commission, a number of local municipalities, the Butler County Board of Commissioners and the Glade Run Lake Conservancy, a 2,000-member citizens group formed after the lake was drained in June 2011. Under legislative redistricting, which goes into effect later this year, Middlesex Township will move into the 41st Senatorial District represented by Senator White. 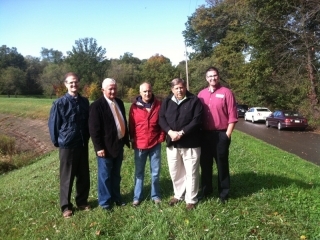 While Glade Run Lake and Middlesex Township are not among the substantial number of Butler County communities included in the 21st Senatorial District represented by Senator Hutchinson, he recognized the importance of its restoration and stepped in to work with his colleagues to promote the project. Senators Scott Hutchinson, Don White and Randy Vulakovich and Neil Converoy from Representative Brian Ellis’s office visited Glade Run Lake last fall with Siggy Pehel, (center in red jacket) president of the Glade Run Lake Conservancy, to discuss the state’s role in assisting the Conservancy in its efforts to restore the lake.